Friday June 10th 1920 Mr Slaby came this morning to put a coat of paint on the wood house. I put in some time today fixing curtains and sewing. Hattie to Aid meeting in afternoon. Cora to store in evening. Wrote Lydia. This is the day we celebrated for Grandmothers birthday. Saturday June 12th 1920 I was all forenoon finished up my curtains and putting my rooms in order. Very warm. We rode to town with Cora after supper. Fannie went too. There was so many on the street that we sat in the car most of the time. Sunday June 13th 1920 Hattie and Edith went to church. Rob & Cora for picnic dinner. We three had dinner alone and rested in afternoon. Cora took us to ride after supper and Ott & Fannie went with us. A very warm day. 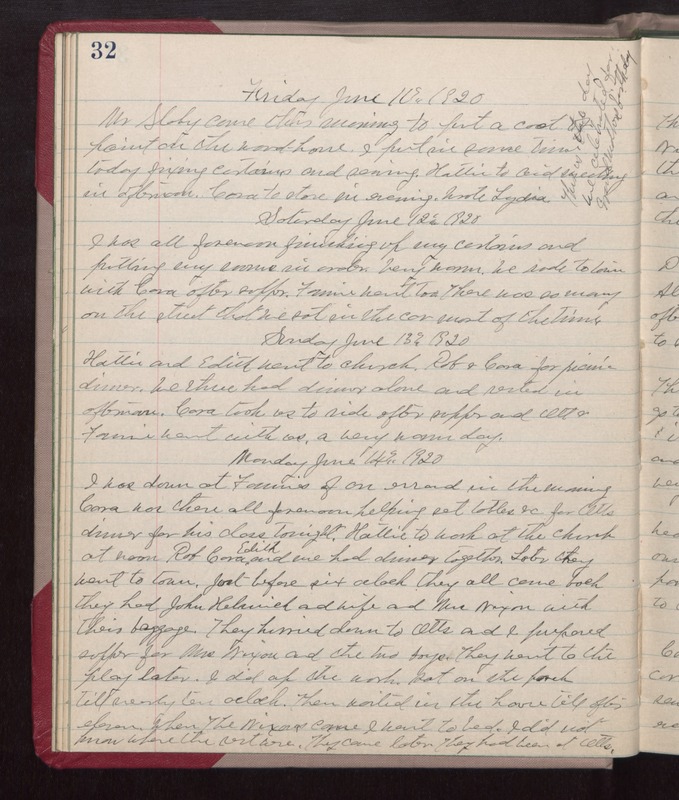 Monday June 14th 1920 I was down at Fannies of an errand in the morning. Cora was there all forenoon helping set tables &c for Otts dinner for his class tonight. Hattie to work at the church at noon. Rob, Cora, Edith and me had dinner together. Later they went to town. Just before six oclock they all came back. They had John Helmich and wife and Mrs Nixon with their baggage. They hurried down to Otts and I prepared supper for Mrs Nixon and the two boys. They went to the play later. I did up the work. Sat on the porch till nearly ten oclock. Then waited in the house till after eleven. When The Nixons came I went to bed. I did not know where the rest were. They came later. They had been at Otts.